MaiTai's Picture Book: Choosing Fleurs d'Indiennes! 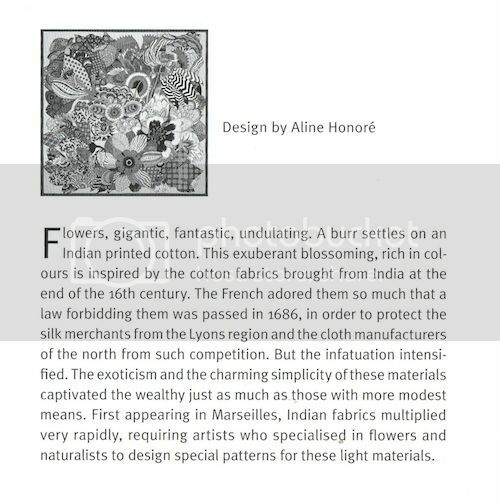 As some of you already know, I adore Aline Honoré's scarf designs, the La Femme aux Semelles de Vent, Cent Plis de Miao and Coupons Indiens are amongst my favorites. When seeing the first preview of her Fleurs d'Indiennes for this SS2011 collection, I very much hoped one of it's many colour ways would suit me. Rule #2 (Be in love with the design) ticked! ...result in two very different looks.. 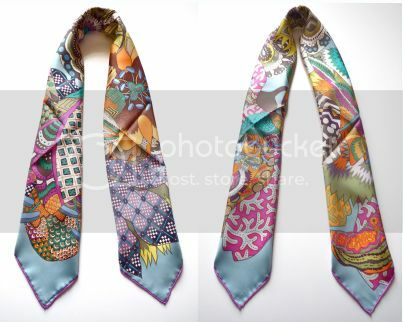 ..I love both ways, so rule # 3 (The design also needs to work for you when the scarf is knotted) got ticked too! When trying it on, it was a real surprise that it did not overpower me, instead it was a definite 'high LOL moment' (thank you for the great expression, dear gracekelly)! Rule # 1 (The scarf should flatter you and illuminate your face) ticked ! The remaining question was, if I would find anything in my wardrobe to team it up with.. Looking closely, there is an immense array of neutral colours in the design, and wonderfully enough, it turned out there is hardly any colour in my wardrobe that couldn't be matched to the FI, it works beautifully in combination with khaki, grey, beige, 'greige', taupe, chocolate, white, teal, plum, rose, steel grey... and if I'd had orange, safffran, yellow, red, turqouise or green clothes, it would go with those too. #6 Never buy anything that does not feel 100% right! - ticked! Oh, that's a gorgeous colorway!! I'm glad you found ways to make it work for you. Beautiful scarf. I love how there are so many designs going on; they all work together so well and the colors are gorgeous! So lovely, and such a breath of spring! Looking forward to seeing you wear it in upcoming postings! I took home the red and white color way of this beauty and adore it. That color way is also gorgeous! This is such a beauty. I can just see this as the next 'Wonder Scarf' in your wardrobe. BTW, this is the exact colourway that I WANT to get the moment I saw the design on H site. I can't wait until the new batch of scarves hit the stores in my part of the woods! Beautiful, MaiTai. I just bought this design in the khaki. Your light blue one was also a contender as was the chocolat one. I can't wait to see modeling pictures. Hi Mai Tai! Can't wait to see this on you. I was at the H Festival of Crafts where they screen printed a ten-color version of Fleurs d'Indiennes. I posted photos on TPF of each step, if you are interested in seeing the design unfold. I have to admit, MaiTai, when I saw this scarf in the store, I shied away from it, thinking that it was too bold. It also deviated from what I usually go for (breaking rule number 5 - be flexible! ), but after seeing it on the bias fold, it's worth taking a look at and seeing if it meets all of the other items on the MT checklist. I very much like your choice, and am looking forward to seeing you wear it. Warm orange hugs, CS. Oh Mai Tai, I love your post! Congratulations on the Fleurs D'Indiennes! It's a beautiful scarf indeed. After trying all the colors, I finally decided on the #09 Chocolat/Rose Poudre/Violine colorway. I went through the same process as you did, and I'm so grateful that you have put these useful pointers in words which is great for our future reference. :D Thanks so much again! Looking forward to your next post on how you rock this scarf. 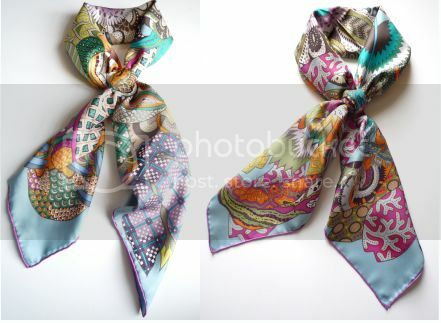 By the way, do you have any pointers on how to wear 2 different scarf prints together? Do we only need to think about whether the colors match, or is there something else to pay attention to, like the mood of the prints? The reason why I am asking is because I love mixing prints such as stripes with polka dots, plaids/abstract prints with floral. 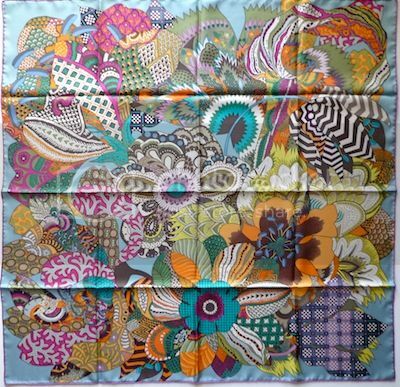 I'd love to do that as well with Hermes scarves because it will be so much fun to experiment, and brings the beauty of the scarves to a whole new level. :D Any advice will be much appreciated. Merci beaucoup! This colorway is the One I`m really looking forward to try. Interesting choice, MaiTai ! I have discounted this one as I don't like 'flowery' scarves and some of the colourways are very bright. Can't wait for your modelling pictures - I bet you change my mind. With your innate sense of style its hard to imagine you could put a foot wrong....and with this new beauty you definately prove once again your immaculate sense of style! Top marks, every box well and truly ticked, can't wait to see it on you as I know it will look just wonderful against your luminous complexion! Oh you got FdI in turquoise! One of my choices but as you already know, this cw didn't work out for me.I'm sure it'll look gorgeous on you and I can't wait to see what you'll pair it with. Congrats on a gorgeous scarf! Congratulations MaiTai - this is a beautiful design - one I hope to buy soon. I am amazed at how the colours in your cw7 work and thank you for showing how you worked it all out! ASW knotting.One thing I know for sure...you will TOTALLY rock whatever you decide:)Happy playing! Such a beautiful choice of scarf, MaiTai - I have looked at the design (only the pink/red one available at my local H so far...). Can't wait to see playtime pics! The decision process is so intelligent and I will be printing this out for future scarf shopping trips! Looking already forward to team her with Spring clothes, dear Reese! Congrats on Ms Red/White, dear EmilyB. Cousin hugs to you! I think you might be right re the wonder scarf, dear AngelaB! Fingers crossed it will arrive at your local soon. Lucky you, dear Stella Rossa! I have seen the pictures, they are so amazing. Thank you for the info :) Hope they will select the FdI for their website colouring demonstration too. Same here, dear CS, so thank god for rule #5! If you get a chance to take a second look, I’d love to hear what you think! Woohoo, the cousin club is growing! Congratulations on Ms Chocolate, dear Mia!! 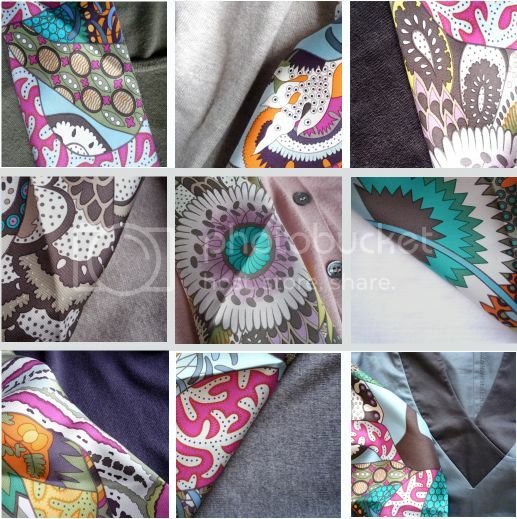 Your questions re mixing prints is a true challenge, as it is something I very rarely do. 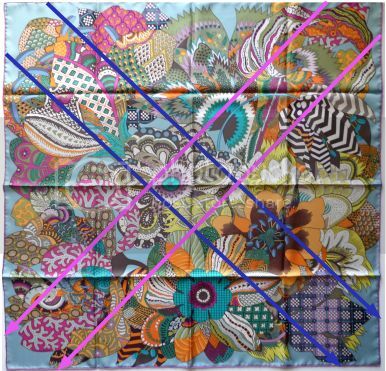 I would make sure there is at least some element which ‘ties’ both scarves together, be it a rapport of colours or pattern. Gracekelly has done a fabulous guest post on the subject some time ago, hope you’ll some find inspiration there.http://www.maitaispicturebook.com/2010/11/maximizing-on-gavroches-by-guest-author.html Good luck! If only I had enough bleu/white wardrobe pieces to justify Ms Bleu/Porcelaine, dear booksnchocolate, but so happy to be cousins with you, congrats again! Between us scarf sisters, we seem to have almost every CW covered, making me fantasise about a FdI meet-up..oh the fun we’d have! Thank you, my dear sushi queen, so happy you like Ms Turquoise! Hope your local will get some other CWs for you to try soon, and happy future scarf shopping trips! I too bought this colourway in January. I was not immediately drawn to it; but once I saw it tied I loved it. I too like to keep an open mind. Here’s to scarves, the miracles they perform, and the joy they give us, my dear Lilian. Hi scarf twin. I have to agree, this particular one has a lot of versatility. It is in high rotation and hopefully it will remain so! Great choice! Belated twin hugs to you, dear liness! This one is going on the list of "must acquire". The colors are gorgeous and the design just makes me smile! Thanks! The "color axis" diagram was helpful. I used to just fold the end with the tag toward the center, now I check the axis and see which color I want to show more of. Oh what a great point, dear Gina! A have quite a few wardrobe items which 'belong' to certain scarves, LOL. Happy scarf and clothes shopping to you! I've bought my first few now and I've discovered my personal rule, based on internalizing the rules here: The scarf must make your heart SING. Nothing less will do. I bought one that looked great online but found the white was too bright for my wardrobe when I got it: but I love it so much I found a way to balance it with a shirt I had been ready to toss (also very bright white). And the whole thing together looks incredible -- better than I could have imagined. I also just picked up "Parures de Maharaja" in orange (with blue accents) -- something louder than I usually wear -- because I could not shake how gorgeous it looked. And it just works: it looks wonderful on me and it makes me giddy every time I see it, even though it's somewhat irrational to love such an unusual combination of colors. I've tried being rational, but that just doesn't seem to work for H for me -- it's on a whole different level. Thanks for the wonderful advice -- you gave me the courage to buy my first H scarves! Many congratulations on your first H scarves! You have chosen wisely, they sound wonderful. Wishing you much fun building your collection, and finding those treasures which make your heart sing!